A beautiful crossover wedding band crafted in 9ct white gold, polished and part set with 15pts of sparkling round and baguette diamonds. An enchanting ring to symbolise the start of your new life together. 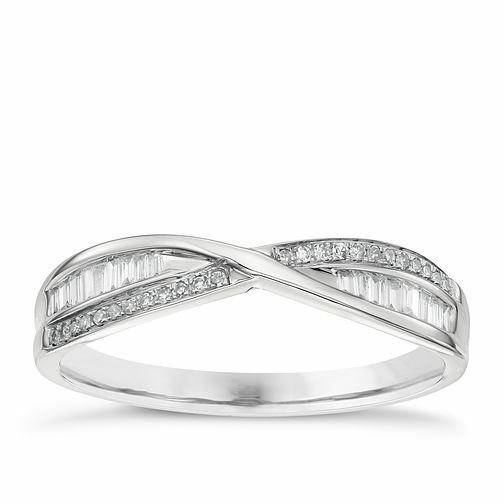 9ct White Gold 0.15ct Diamond Crossover Wedding Band is rated 5.0 out of 5 by 2. Rated 5 out of 5 by Anonymous from Excellent Ring Excellent ring. Very impressed with the quality. Prompt delivery & good customer service. Rated 5 out of 5 by Anonymous from So pretty Beautiful ring and very comfortable to wear, no pointy edges and I love that it has two different diamond cuts. It fits very nicely around my solitaire engagement ring.